OK, here are some pics of my Eagle with the recently installed Charlie Christian pickup. Here it is shoulder to shoulder with my Aria D’Aquisto Avantgarde. This entry was posted on	September 17, 2007 at 3:48 pm	and is filed under Charlie Christian, Pickups. Why change out your pick -up? Trying to get a vintage sound? It’s all in the hands baby. No offense but I’ve always wondered why guitar players keep switching pick-up. Do you want to sound like Barney Kessell? 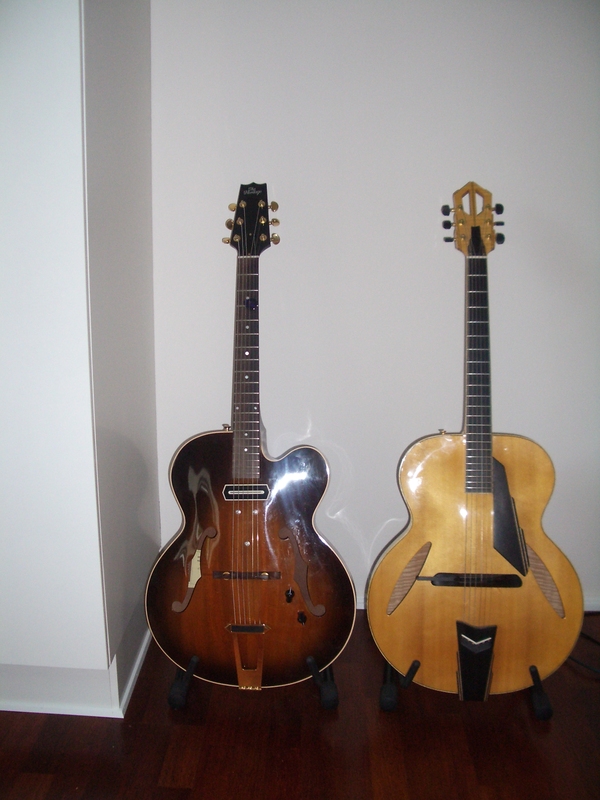 I know guitar collectors look for the obscure but players don’t. Reason #1: The earlier pickup was awful. Reason #2: It is not _just_ in the hands, baby. Reason #3: I always liked the Christian and (the early) Raney sound (rather than Barney’s although that is good, too). I have not been disappointed. I am extremely happy with this pickup. And, for the record, this is the only pickup I have ever changed. Wow! I am astounded by the look of that Heritage! For a second I thought you must have stolen Barney Kessel’s! 🙂 Was it originally routed for a CC? Can’t stop thinking what a great guitar this must be! Ever since I saw BK I wanted a Venetian cutaway with a CC. Do you have any clips? The guitar is — to my ears — the best sounding archtop I have ever heard 🙂 However the CC sound isn’t everyone’s favorite. No clips at the moment. I strongly endorse the UK-produced CC pickups. And I wish more people would xperiment with putting them on other guitars than Gibson L48 or L50s. 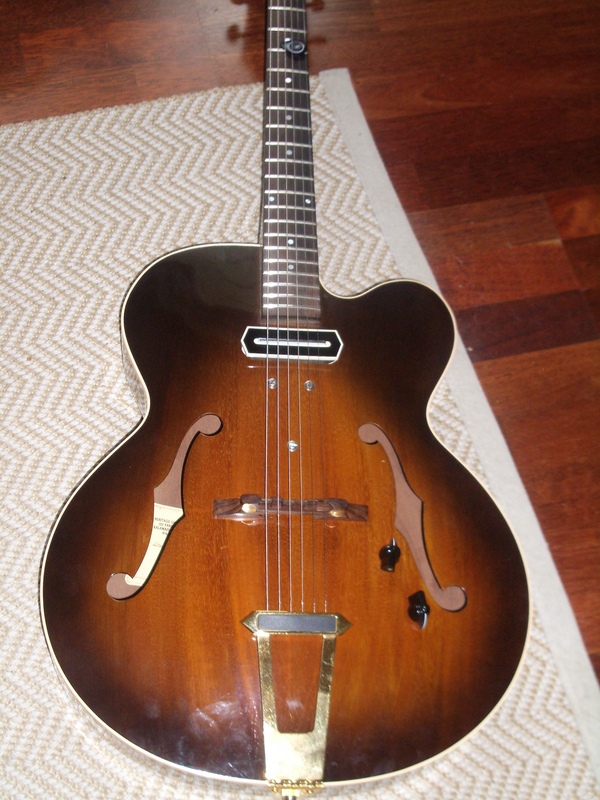 Why not put one on, say, a dull 1970s ES-175, or, who knows, that Epiphone Joe Pass? OK, they are pretty costly and installing is easily even more costly, so I understand a certain reluctance to experiment too much. nice guitar. i thought it was barney kessel’s at first glance. you even got the same tone/volume knobs. where did you get that gold tailpiece? Joey, Actually, the similarity to Barney’s old Gibson is entirely unintended. I simply happened to have this Heritage Eagle which although a nice guitar isn’t very impressive acoustically and which came with an awful pickup. Changing to the CC pickup made it an excellent electric. The gold tailpiece is original. The guitar is an early batch of the Eagle with gold hardware (the Eagle usually has chrome hardware). Here it is completed- with a custom L-4 style fitted pickguard. Routed for P90, CC pups, L-5 Gibson Tailpiece, 5 holes drilled for vol/tone pots and 3 way selector switch, ivory inlayed bridge base and a custom made L-4 style pickgard (5 ply, beveled edge). 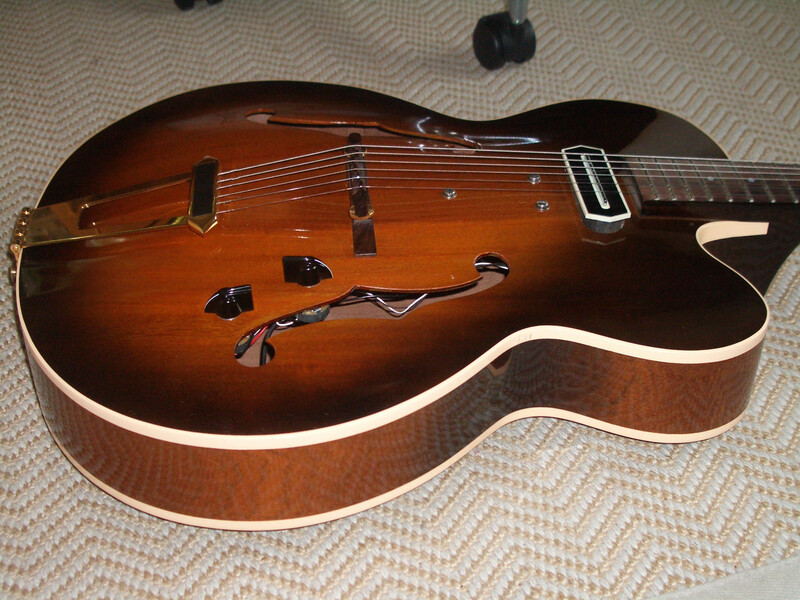 This guitar was orignally equipped with a Frequensator tailpiece, floating mini-humbucker with controls on the pickguard, and a std Epiphone style pickguard. Even with all the new holes and pup slots, this guitar is acoustically louder than most electric archtops I’ve played. Nicolai…I forgot to mention this—your modified Eagle looks GREAT! Wow, that is an awesome looking guitar… but you really should clean up that wiring harness. It looks rather slapdash, and the guitar, otherwise, looks like €1 000 000.